Our Whisky Ladies are generally an adventuresome set. Which is why our whisky explorations are not limited to your standard Scottish fare… not to say we don’t thoroughly enjoy a solid Scottish dram, just that our predilections lean to the off-beat rather than well trodden paths. Which sometimes leads to some rather stellar flops! Most recently the AD Laws Triticum + Hordeum stand out as whiskies we would never ever chose to repeat. On the other end of the spectrum, that very night Canada‘s Shelter Point was an instant hit and another evening Finland‘s Teerenpeli 10 year was just yum! We know when you take risks with your whisky choices there will be some delicious surprises mixed in with some unmitigated disasters! 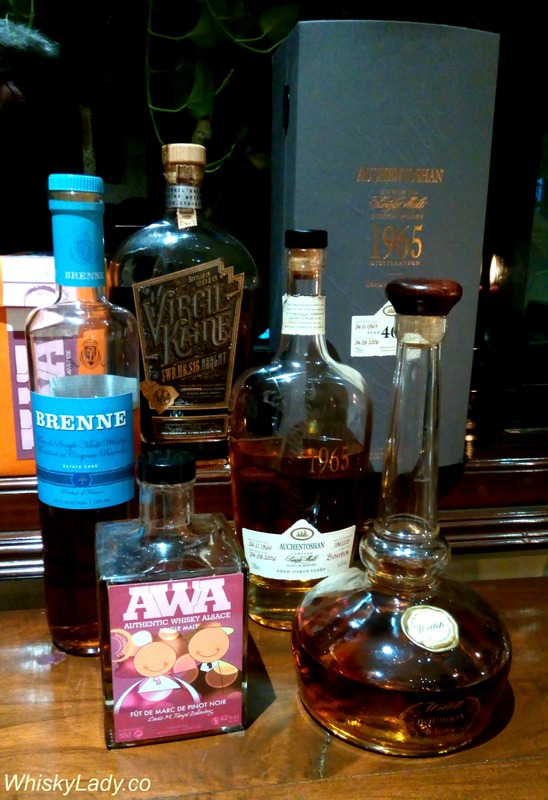 Then we added brilliant bonus drams… Our whisky lady host of the evening was celebrating her 40th birthday. What better way than with a 40 year old Auchentoshan!! And her whisky lady mother then decided we simply must have an extra desert treat of a rather bonus bourbon Willlett. This entry was posted in American, Beyond Scotland, European, France, Lowlands, Scotland and tagged Auchentoshan, AWA, Brenne, Virgil Kaine, Willett by Carissa Hickling. Bookmark the permalink.